Since 1925, Tiger General LLC has been selling and building top-quality trucks, trailers and machinery in rural Medina, Ohio. Founder Bovie Overholt set high standards for quality work at a fair price, had he passed his vision on to his son Mark, who overseas the business today. Whole there are a number of products that Tiger General LLC provides, it specializes in oil service equipment, including swabbing rigs, double-drum workover rigs, VAC trucks and winch rig-up trucks. As Mark Overholt strives to maintain the tradition of quality and service for which Tiger General LLC has become known, he has also continued the Tiger General LLC membership with NFIB that was first initiated in 1949. Overholt continues another tradition of his father’s by voicing his concerns for the protection of free enterprise in Ohio. Overholt is primarily concerned about EPA and other government regulations that he describes as “smothering.” HIs involvement in the NFIB has picked up right where his father’s left off because he values NFIB’s ability to challenge state and federal government by articulating small-business concerns. 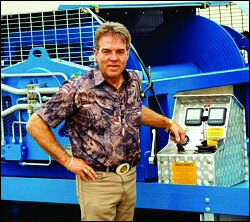 As a business owner, Overholt gains satisfaction from running a business with honesty and integrity. His rigging and trucking equipment are high-quality products backed by the best guarantee in the industry, and he gives a great deal of credit to Tiger General LLC’s 18 employees whom he describes as knowledgeable, hardworking and experienced. He also likes to keep the family involved. His wife Sherry is the company’s vice president and his son Jon also works at Tiger General LLC.